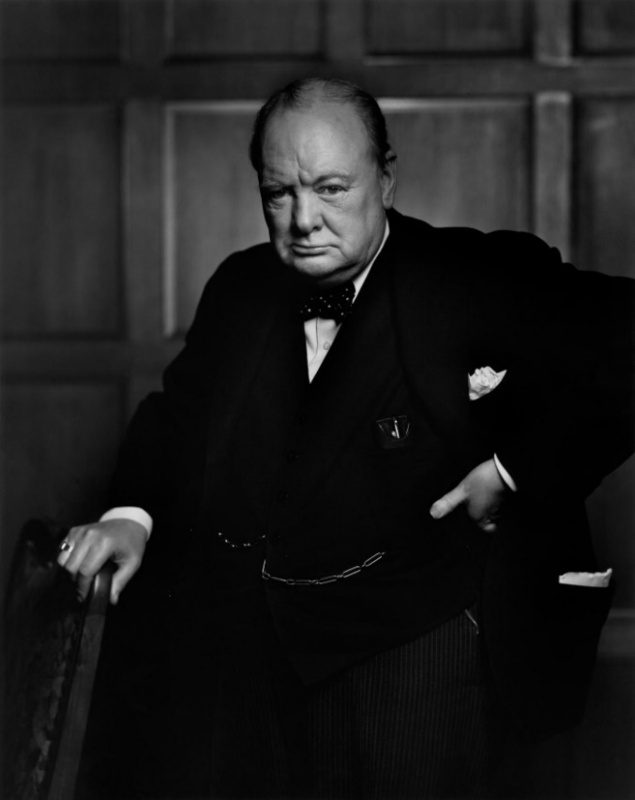 # 1 on the list of Great Britons was Winston Churchill. Sir Winston Leonard Spencer-Churchill KG OM CH TD DL FRS RA was a British politician, army officer, and writer, who was Prime Minister of the United Kingdom from 1940 to 1945 and again from 1951 to 1955. 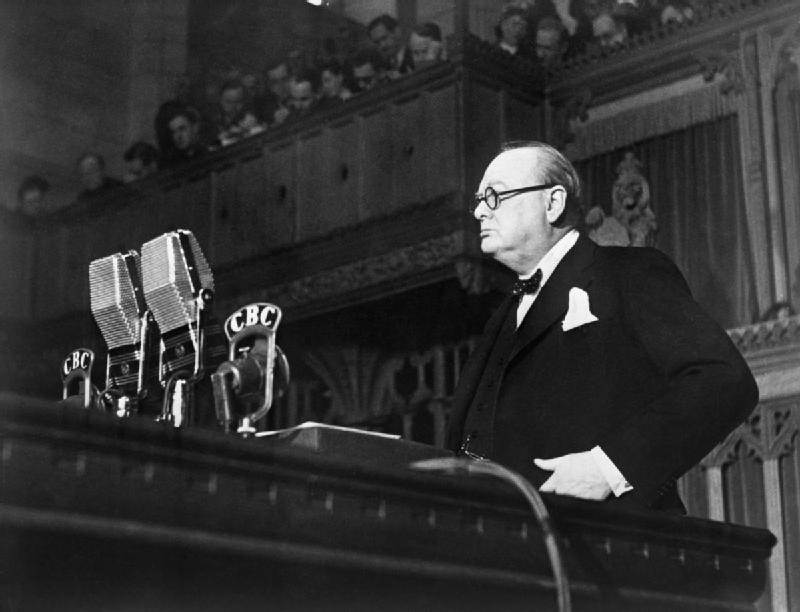 As Prime Minister, Churchill led Britain to victory in Europe in the Second World War. 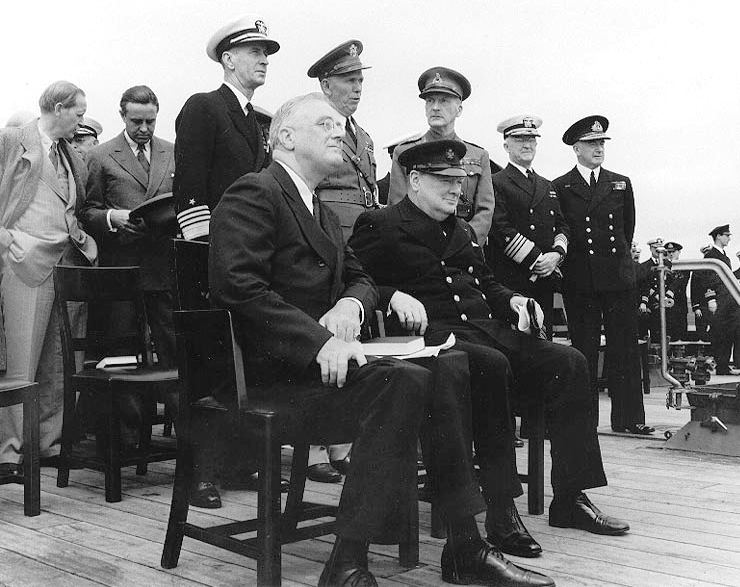 Churchill visited Canada eight times and once meeting with President Roosevelt off the coast of Newfoundland, pre-confederation, Aug. 9, 1941. British Prime MinisterWinston Churchill arrived aboard the battleship HMS Prince of Wales (three months earlier HMC Prince of Wales was involved in the hunt for and sinking of the German battleship Bismark) at Placentia Bay for a secret meeting with President Franklin D. Roosevelt (Roosevelt arrived on the USS Augusta (along with five destroyer escorts), a Northampton-class cruiser of the United States Navy. (notable for service as a headquarters ship during Operation Torch, Operation Overlord, Operation Dragoon, and for her occasional use as a presidential flagship carrying President Roosevelt) prior to America entering WWII. His visits to Canada during World War II, meeting the Canadian Parliament, and later in the war his two meeting with President Roosevelt at Quebec City are well recorded. He viewed Canada as being able to speak English and American so he used Prime Minister Mackenzie King as a conduit in reaching out to President Roosevelt. Winston Churchill arrives on Parliament Hill, cigar firmly e trenched in his mouth. 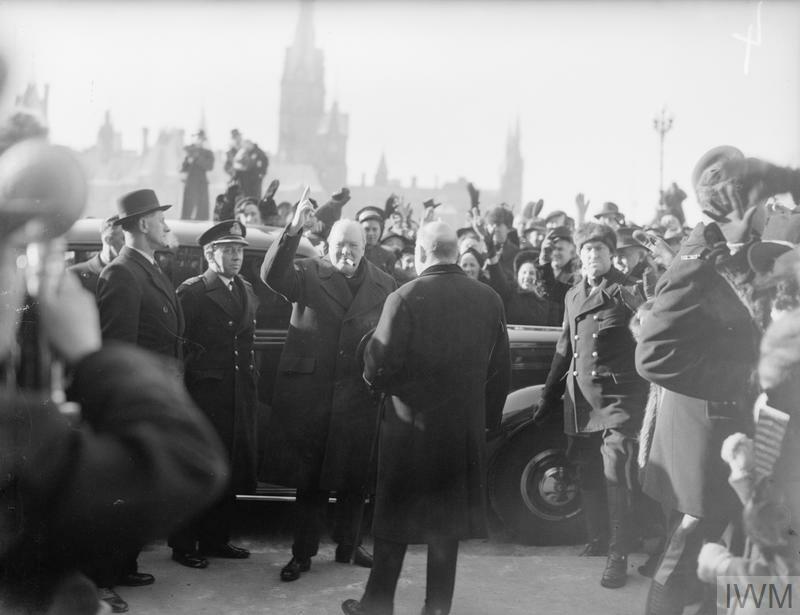 He is greeted by Prime Minister Mackenzie King (back to the camera). December 1941 the United States joins Canada and Great Britain in the war against Germany and Japan, and Winston S. Churchill, Great Britain’s charismatic new prime minister, travels to Washington, D.C. to meet President Franklin D. Roosevelt. His next stop is Ottawa, where on Dec. 30 he delivers an electrifying address that stirs the passions and strengthens the resolve of Canada a nation at war. Churchill to Parliament: “I warned the French that Britain would fight on alone whatever they did, their generals told their Prime Minister and his divided cabinet, ‘In three weeks England will have her neck wrung like a chicken.’ “Some chicken!” [when the laughter and desk thumping died down in the House of Commons Churchill followed with… “Some neck!” Another great Churchill speech! 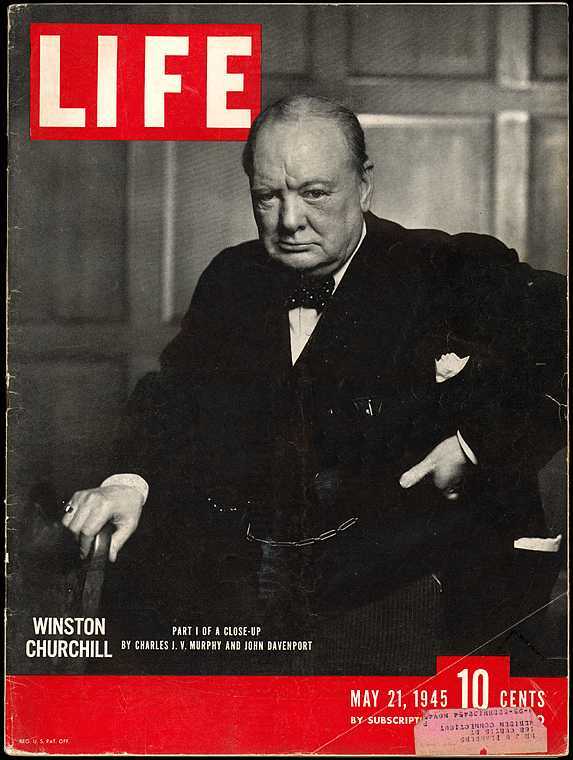 The photograph was featured on the cover of LIFE magazine in 1945. 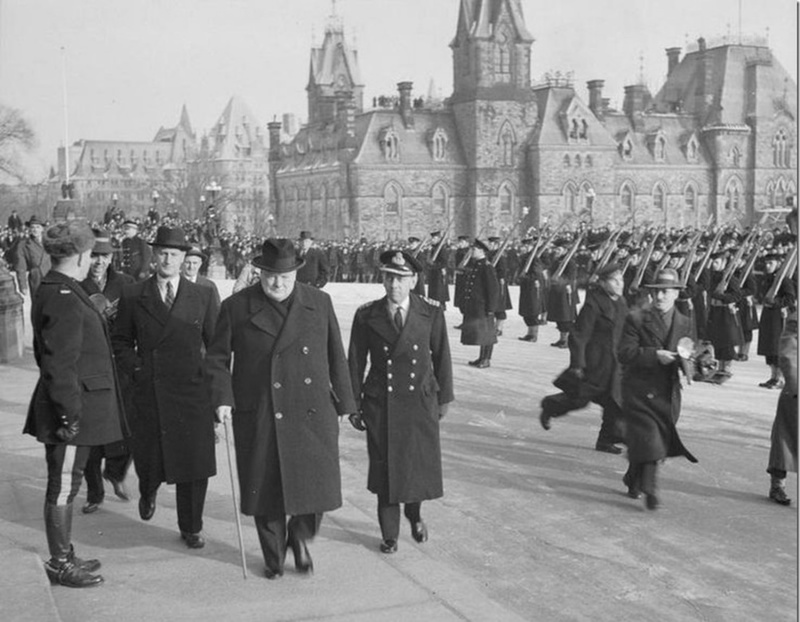 Below: December 1941 Churchill arrives on Parliament Hill. 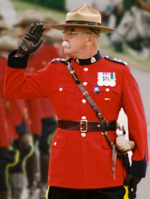 I wonder if the RCMP membershave their side arms on under their Pea Jackets? Considering what was going on in the world in 1940 you would think that security, even in Canada, would be at a maximum for Hitler’s arch enemy the Prime Minister of Britain. 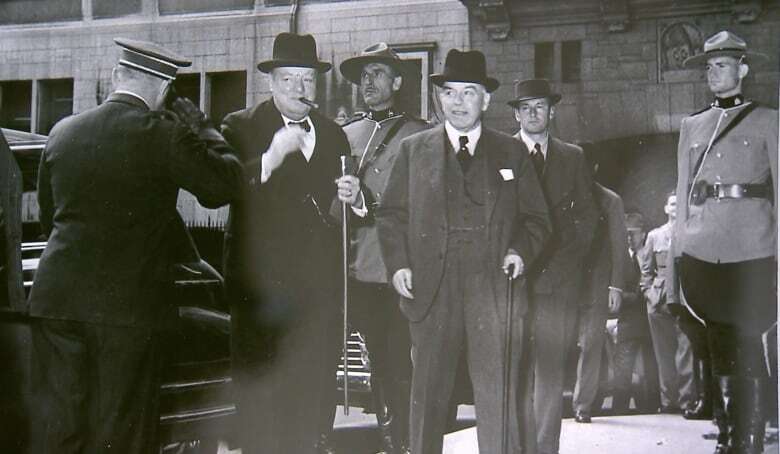 Below: Churchill and MacKenzie King arrive in Quebec City for the Quebec Conference. Who were those members? I wonder if they had a framed picture in their “Man Caves” of this historic moment. Mackenzie King, Franklin D. Roosevelt, Winston Churchill, and the Earl of Athlone, Governor General of Canada, at La Citadelle. Mackenzie King and the G.G. were there solely for the photo op. The First Quebec Conference (codenamed “QUADRANT”) was a highly secret military conference held during World War II between the British, Canadian, and United States governments. 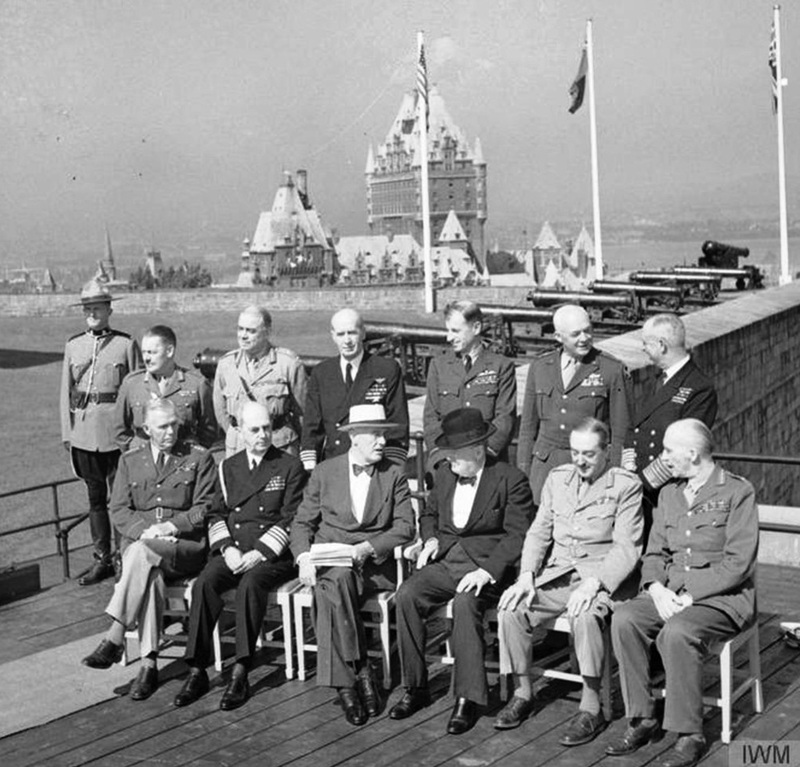 The conference was held in Quebec City, August 17, 1943 – August 24, 1943. It took place at the Citadelle and at the Château Frontenac. The chief representatives were Winston Churchill and Franklin D. Roosevelt, hosted by the Canadian Prime MinisterWilliam Lyon Mackenzie King. Although, Churchill suggested that Mackenzie King be involved in all discussions, Roosevelt vetoed the idea. As a result, Mackenzie King’s hospitality was almost purely for ceremonial purposes. was the host but not a participant in the meetings. 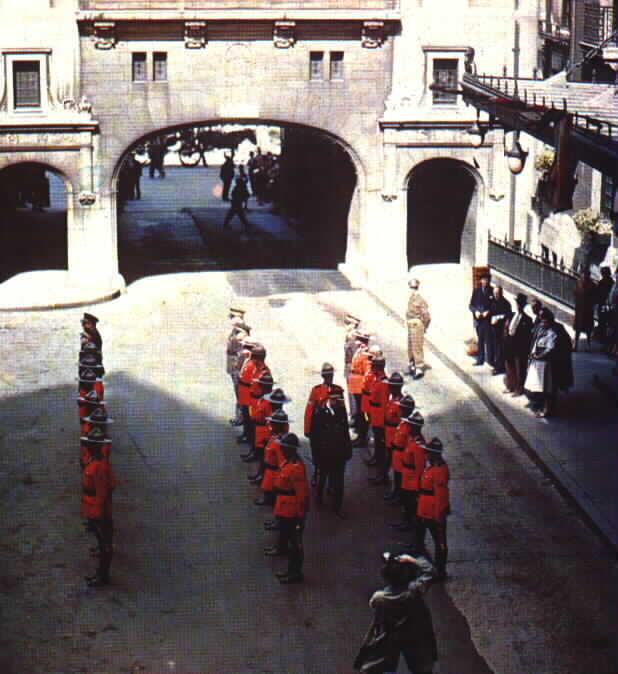 After Churchill’s visit to Canada, December 1941, and his speech to parliament, even the “Greatest Briton” received the “Mountie” treatment. The editorial cartoon below appeared in “PUNCH” magazine in January 1942. 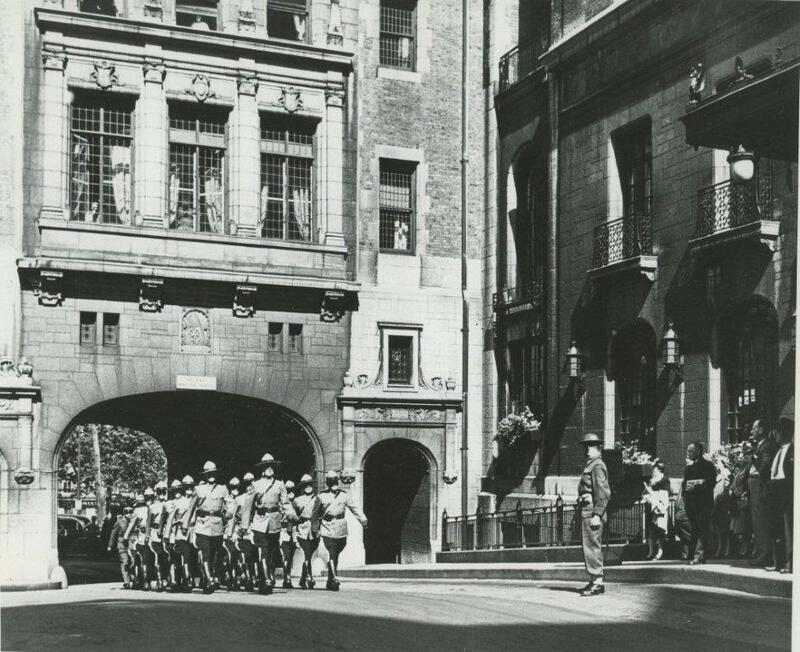 During World War II Canadians while holding in Britain were training for the fight to come in Europe. One of the many duties performed in England was the honour of guarding Chartwell the summer home of Churchill. On one of his infrequent wartime visits to his country home, Churchill was saluted by a soldier of the Hastings and Prince Edward Regiment and had a scintillating conversation! “Why don’t you challenge me, Canada?” growled Churchill.